The likely return to political balance between the parties in Washington may result in the 'gridlock' the market has historically favored. NEW YORK ( TheStreet) -- The GOP is likely to take the majority in the House and hold about half of the Senate. The likely return to political balance between the parties in Washington may slow the pace of legislative change and result in the "gridlock" the market has historically favored. The President's party has traditionally lost seats in Congress during the midterm elections making it harder to pass new legislation in the second half of the Presidential term. This pattern is magnified this year in terms of impact. Based on polling data, the 2010 midterm elections are likely to mark a return to a balance across the aisles in Washington as the political pendulum swings back from the sweeping majority in the House and Senate the Democrats picked up in 2006 and consolidated in 2008. This balance lowers the probability of dramatic legislative changes and is likely to result in the return of "gridlock." Historically, the stock market has performed better under periods of "gridlock," but this record is far from consistent. Not surprisingly, other factors appear to bear more weight than politics. On the other hand, the bond market clearly has performed much better during periods of gridlock, most likely because investors assign a lower probability to the passage of new spending initiatives that would increase the debt supply. With the start of the fourth quarter, the stock market entered what has historically been the best four-quarter period of performance during the four-year presidential cycle. Since World War II, the stock market has always posted a double-digit gain from the end of the third quarter of year two to the end of the third quarter of year three of the Presidential cycle, and that gain has consistently averaged an impressive 30%. Historically, the Presidential cycle of stock market performance has been driven largely by changes in monetary and fiscal stimulus to the economy. These changes are evident again in this cycle. Our outlook for the coming four quarters is for modest gains that are comparatively low for similar-period performance during the past five decades and we expect the gains to be accompanied by higher-than-average volatility. 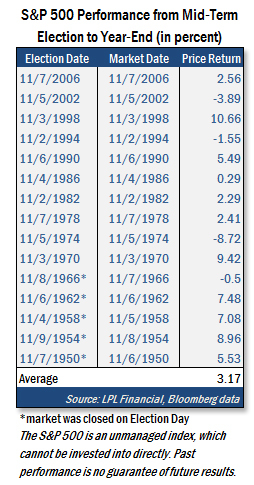 Interestingly, the last time the market earned a gain of less than 15% during the four quarter period that began at the end of the third quarter of a midterm election year was 1978 -- when inflation was soaring to double digits, the Fed was aggressively hiking rates, and economic growth was sliding into the recession that officially began in January 1980. While we expect a less than 15% gain in the stock market over the four-quarter period that began at the end of the third quarter of 2010, in contrast to 1978 the environment is much more favorable. For example, inflation is relatively tame today, the Fed is providing more stimulus rather than taking it away, and we do not expect the current period to close with the same economic fate. Two reasons that the market may follow the historical pattern with gains in the coming year are the support that may come from extending the Bush tax cuts and the potential for stronger job growth. The election sets the stage for Congress to address the Bush tax cuts due to expire at the end of the year. Neither party wants the tax cuts to completely expire given the negative impact it would have on the economy as tax withholding rates would immediately jump higher for most workers. However, there is not much time for debate with Congress only scheduled to be in session for one week during the month of November. The path of least resistance appears to be that PAYGO (Pay-As-You-Go) rules that require budget offsets to any tax cuts are waived allowing the extension of many, if not all, of the Bush tax cuts for one or two more years. Sidebar: If no progress is made on extending the current 15% long-term, capital gains tax rate in 2011, the potential for a rise in the rate may prompt investors to sell to lock in the 15% rate. However, there are not a lot of long-term capital gains to be taken in the stock market with the major averages still down sharply from their 2007 highs. The selling would most likely take place in sectors that have generated the largest long-term capital gains for those investors who bought stocks in the first half of 2009, such as Financials. A potential outcome of the year-end dividend rate tax hike could be a large number of public companies with a high concentration of family and closely held shares declaring and making a one-time, special dividend payment in the fourth quarter to take advantage of the 15% tax rate before it goes away. One of the positive potential outcomes of the midterm elections is stronger job growth. Based on the historical relationship between job growth and the stock market during the business cycle, job growth should be much stronger. During the uncertainty created by the rapid and sweeping legislative and regulatory reforms of the past year, businesses have been hesitant to make the capital commitments to growth such as expanding their workforce. The return of gridlock is likely to mean a much slower and more moderate path of legislative change. In the absence of legislative and regulatory uncertainty over the potential for major changes in health care costs, taxes, and other key factors, job growth may be stronger. As stability returns to the near term legislative environment business leaders are more likely to make the commitments to growth that drive the economy including additional hiring. Since investors appear to have already bought into the rumor of a favorable outcome to the election given the gains of recent weeks investors might sell upon the news of the actual results. However, we believe that the election outcome is not fully priced into the stock market and could experience further gains if the GOP has a better-than-expected showing and takes the Senate. Historically, the stock market has provided post-election gains. The stock market, measured by the S&P 500, in the fourth quarter of a midterm election year has nearly always been positive and has posted an average gain of 7.9%. There were only two years when the market posted declines, 1978 and 1994, and in both of those years the Fed was hiking rates aggressively, an event that is highly unlikely this quarter. While it may appear that the fourth quarter has already posted solid gains in anticipation of the election outcome, the market typically provides additional gains following the midterm elections. One reason for additional gains for stocks this quarter is related to the prospects for tax cut extensions. We believe a positive impact of the resolution of uncertainty around tax rates is probable given that the outcome is likely to be better than what investors have priced in to the markets. However, a factor that could undermine the impact of any positive action on taxes is that the changes may not be permanent. A one-year extension of current tax rates may not be as welcome as a resolution of the tax rate uncertainty. Nevertheless, the resolution of the uncertainty with a late-year passage of an extension of the Bush tax cuts for 2011 would be welcomed by the markets. The stock market seems to have priced in the return of gridlock and the GOP potentially taking the House, but a surprise takeover of the Senate by the GOP could have further ramifications for some sectors. We may see a relief rally in the legislation-sensitive Financial sector as the anti-business tone diminishes. If the GOP takes the House, it will result in the change of chairmanships of key committees. For Financials this means Rep. Barney Frank will no longer be chairman of the House Financial Services committee. While major changes to the financial reform law passed this year are unlikely, a GOP Congress might influence regulations implementing the new law. Republicans would likely look to address Fannie Mae and Freddie Mac conspicuously left out of the Democrat-led financial reform law. The Health Care sector may also see a relief rally. While major changes to the Health Care reform legislation passed this year are unlikely, risks to HMOs, pharmaceuticals and biotech companies decline marginally under GOP leadership. A sweeping win for the GOP holds the most promise for the Health Care sector as investors question the potential for repeal of all or part of the Health Care overhaul act. As previously mentioned, the extension of Bush tax cuts would mean the dividend tax rate of 15% stays instead of going to 39.6%, a plus for companies with lots of cash to distribute. High dividend-paying sectors such as Telecommunications Services, Consumer Staples and Utilities may benefit. Cash-rich companies in other sectors may also benefit as they introduce or substantially increase their dividend payout as they look to attract a new class of investor seeking yield. Companies in the Energy sector may be impacted by a strong election for the GOP in a number of ways. Regulations on offshore oil and gas drilling in the Gulf of Mexico would be more favorable for business as would EPA regulations on limiting greenhouse gas emissions. On the other hand, alternative energy companies would face a less supportive outlook for subsidies. Sectors highly sensitive to trade may benefit from a strong showing by the GOP. Republicans support many of the pending Free Trade Agreements allowing them to be approved through cooperation between the Republican Congress and the White House without risk of a democrat filibuster. The risk of China trade protectionism should diminish - a plus for retailers dependent on low cost imports and U.S. exporters of capital equipment fearing Chinese retaliation. The election could hold positives and negatives for companies in the Industrial sector. While budget pressures remain for the defense industry, major defense contractors in the Industrial sector will likely fare better under a strong GOP election outcome. On the other hand, the renewal of the surface transportation bill will likely be smaller under GOP leadership resulting in fewer government dollars for engineering and construction companies. While a strong showing by the GOP may not undo the reforms passed this year, it may reduce the risk of additional legislation that could harm corporate profitability in 2011. In addition, the slower and more moderate pace of legislation and regulation in Washington, along with the fading perception of an anti-business environment, may lift the uncertainty that is hurting investment and hiring -- especially by smaller businesses less equipped to navigate the changes. We believe the midterm election outcome has the most significant longer-term market impact. However, the Fed meeting the day after the election holds major market-moving potential as the Fed has the potential to surprise or disappoint investors with the size and scope of the stimulus plan to be unveiled in its statement released at 2:15 PM ET on Wednesday. The midterm election of 1994 is instructive on this point. It was a landslide win for Republicans and even had the upside surprise of the GOP also taking the Senate and not just the House, as had been expected. Yet stocks posted a modest loss from the time of the midterm election through the end of the year as monetary policy dominated the election outcome with the Fed hiking interest rates and withdrawing stimulus from the economy. Which Party Is Best for Your Portfolio?